Get to know all about the Law 231 with Magistrate Guariniello. 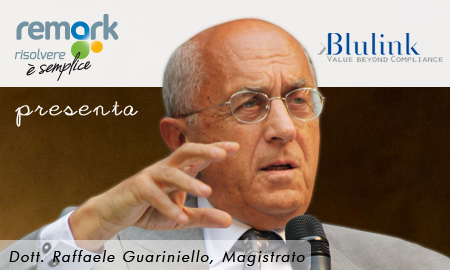 Blulink Seminars and Conferences 2014 Get to know all about the Law 231 with Magistrate Guariniello. Blulink together with Remark Group invites you to the new appointment with the magistrate Raffaele Guariniello – Deputy Public Prosecutor at the Court of Turin, coordinator of the job security of the Court of Turin. study on risk confined spaces. Who should participate: entrepreneurs, managers, supervisors, safety managers, workers and professionals. Participants will be issued a certificate valid for the purposes of the update for the RSPP, ASPP and Coordinators. Fee: € 149.00 plus VAT. Best price: pre- registration by May 31, 2014 at the special price of € 119,00 + VAT per participant. 1-year use of the online portal “System Environment and Security” (worth € 190.00 ). Please see the Event page where you can find all the information for the correct entry.